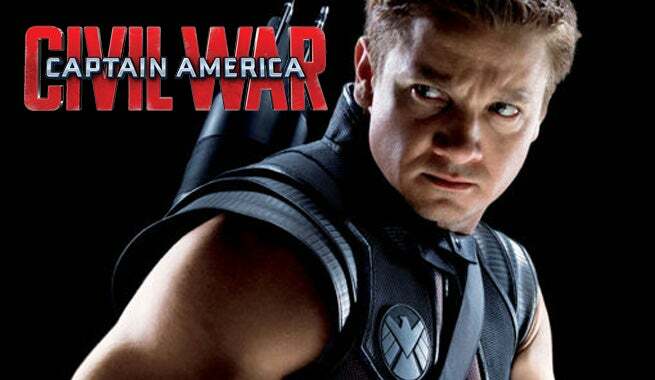 Jeremy Renner has unveiled Hawkeye's new costume! Over the weekend, at Wizard World Chicago, Renner said that his favorite costume was the latest one, "the one from Civil War." It's easy to see why, now! He even brought Ant-Man along, which means Scott Lang will be on Captain America's side (as hinted in the Ant-Man post credits scene), seeing as Renner confirmed his Hawkeye was written onto Team Cap. This decision makes sense, seeing as Hawkeye wants to protect his family (which we met in Age of Ultron) safe and secret. Nevertheless, the sides have been drawn! What do you think of the new Hawkeye costume? Are still waiting for a mask? Don't hold your breath. Renner also confirmed that Hawkeye won't be wearing a mask through Infinity War, but rather, would follow the path of "the Ultimates version." With this costume, all we really need is more and more Hawkeye in the movies to satisfied, at this point! Captain America: Civil War hits theaters May 6, 2016.